This aphid is a major pest of damson and plum, distorting foliage and stunting growth; affected leaves often turn yellow and may drop prematurely. Infestations may be extensive and can have a considerable effect on cropping, as fruits on affected branches remain small and are of poor quality. Infestations on summer hosts (e.g. chrysanthemum) cause leaf mottling, stunting and distortion; in continental Europe, this species also damages sunflower crops. Infestations on clover (by the distinct form Brachycaudus helichrysi warei Theobald) may result in leaf mottling and reduced seed yield. Brachycaudus helichrysi is a vector of plum pox virus ('Sharka disease'), and a potential vector of non-persistent viruses (e.g. potato virus Y) on crops it feeds upon but does not colonize. 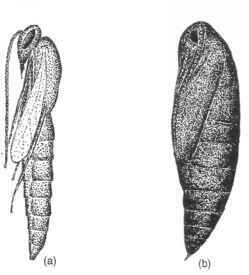 (gynoparae) then produce a wingless generation of oviparae that, after mating with the winged males, deposit the winter eggs. Under warm conditions (including heated glasshouses in temperate regions) this species breeds partheno-genetically throughout the year and lacks a sexual phase (i.e. is anholocyclic); the clover-inhabiting form B.h. warei is also believed to be anholocyclic.